Gay Johnny Vegetable Crate Label. Original crate label from J.S. McManus Produce Co. Weslaco, Texas. Image of young boy dressed as cowboy, with smaller images of cowboys in lower center of label. Gay Johnny Vegetable Crate Label. 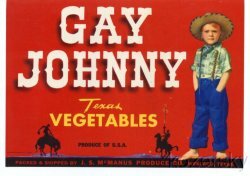 Original, vintage Gay Johnny Texas vegetable crate label. Label states: "Packed & Shipped By J.S. McManus Produce Co. Weslaco, Texas." Image of young boy dressed as cowboy, with smaller images of cowboys in lower center of label. Label measures 7 x 5 inches. It is in excellent condition with no tears, bent corners, or creases. Shipped securely in a heavy board envelope.